Centre for Alternative Technology01654 705950work Guest AccommodationThe Centre for Alternative Technology (CAT) is a world-renowned eco centre set in the foothills of the South Snowdonia National Park. With seven acres of hands-on displays, examples of environmentally responsible building, renewable energy, organically managed gardens and family activities during holiday seasons, CAT is a hugely popular visitor attraction in Mid-Wales. CAT’s on-site accommodation is housed within the WISE building, a beautifully designed and award winning eco facility right in the middle of the Visitor Centre. 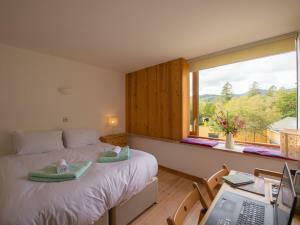 The 24 twin and double en-suite bedrooms offer stunning views into the Snowdonia National Park, and first floor rooms come with a shared garden terrace so you can really make the most of being in the heart of the Welsh countryside. All bedrooms are serviced with solar-thermally heated showers and basins and are heated by CAT’s on-site biomass facilities. Breakfast, lunch and evening meals are available within the CAT Café, a poplar and comfortable wholefood vegetarian café. Ingredients are locally sourced where possible and freshly grown produce from the CAT gardens are delivered to the kitchen daily by our gardeners. Guests are welcome to enjoy free entry to the CAT Visitor Centre, to explore the sustainably managed woodland and stomp round the quarry trail which takes you up into the hills to see the old quarry site and offers stunning views over the valley. CAT’s accommodation is ideal for couples on a holiday in the area, individuals on a break or away on business and larger groups of adults staying in the area to take advantage of all the activities on offer in the region. The Centre for Alternative Technology (CAT) is a world-renowned eco centre set in the foothills of the South Snowdonia National Park. With seven acres of hands-on displays, examples of environmentally responsible building, renewable energy, organically managed gardens and family activities during holiday seasons, CAT is a hugely popular visitor attraction in Mid-Wales. CAT is easily accessible by road and only three miles from the friendly town of Machynlleth, which has regular rail services from Birmingham and Shrewsbury.